[Post Updated] Before someone goes "have you heard about the new Ben & Jerry's stuff?" in the comments somewhere, yes, I have heard and no, Ben & Jerry's never sends me anything (except once a long time ago) so I have no official pics for you yet. For now, visit (or follow) Junk Banter, Fun Size Reviews or some other lucky* instagrammers for the hands on pictures. *Yes I am bitter that I never get free Ben & Jerry's stuff (though I do appreciate that they've had both Nick and I up to their headquarters). At least I know what to look for now. Happy Hunting! Update: Ok, I feel better that there was only a two day delay between instagram pics and updated website pictures. That said, they haven't removed any discontinued flavors yet. I have no solid proof, but I suspect that the new Truffles line up is at least partially supplanting the Core line up. I've seen discontinued tags on Coconuts for Caramel Core, Spectacular Speculoos Cookie Core, and Peanut Buttah Cookie Core. Now core flavors do come and go, and now that I look back, I am reminded that we didn't get any new cores in 2017. They wouldn't (eventually) ditch the core lineup again would they? Why not make at least one new core to keep it relevant? Update #2: Bne & Jerry's has one more thing for us: Moo-phoria Light Ice Cream. The flavors are chocolate milk & cookies, caramel cookie fix, and P.B. dough. They are billed as "Light on calories and fat, heavy on the flavor, chunks & swirls", I'm sure a lot of people won't be excited by the fact that it's just light ice cream, but I like this line in particular: "We stayed away from sugar substitutes and sugar alcohols so you could enjoy our flavors without an aftertaste". I'll take light ice cream over erythritol 10 times out of 10. You can find more info here. It is strange that they don't send samples to you - especially since your focus is on mainstream (more affordable) ice cream. I will try the new flavors (with the exception of the the coffee flavor), and I will try the new pint slices (again, with the exception of the coffee flavor), but they aren't nearly as exciting to be as the new Haagen Dazs flavors or even the new Magnum pints (I also noticed on the Magnum website that they have a new Double Cherry ice cream bar). Of late, Ben and Jerry seem to go for gimmicks - (not that Magnum tubs aren't a gimmick - but the flavors seem classier) that are fun to try once, but aren't necessarily flavors I ever buy again. I think Haagen Dazs actually creates flavors that are worth repeat buys. I am often sad when they disappear. Blogs are too old fashion I guess, need 5 digit instagrammer followups maybe, iunno. Hmmmm. Still curious to try the Magnum tubs. I’m most curious about raspberry dark chocolate and chocolate hazelnut. sorry, I wasnt saying the magnum tubs arent fun in some respects, I just wish they backed it up with a higher caliber ice cream (the insides should be more Haagen-Daz and less Breyers). Expanding your reviewers? At this point you seem to be the only one (I understand nick has a young kid now) which limits reviews. Also expanding geographically to catch areas that have product you don't have access too. The website is good but doesn't seem to open up a lot of room for discussion. As you know all post have to be approved first which doesn't lend it self to a lot of community discussion. Google blogs arent great at commenting, it's kind of an all or nothing approach. Let everything in or force everyone to login to comment (I go with the everything approach which is why so many comments on here say "anonymous"). Moderating is my way of keeping out the people who cant keep it classy. Over the years there has always been the rumor that I filter out people who disagree with me, but in fact I really only filter out commenters who nastily attack other comments and for the most part this isn't too often. That said, to give you a little perspective: there are 21850 comments in my blogger spam filter. Granted I haven't deleted them in years (there is no ability to flush them, you have to manually delete them). Check out the Haagen Dazs website. They have three new trio flavors that sound fantastic! Yeah, I had seen some of the new stuff almost two weeks ago now but I didnt realize they posted new Trios. They look amazing. The funny thing is that I said H-D should make a trio with white chocolate when I did that white chocolate magnum tub review. I feel like the Core lineup was a misstep. Never really read any blow away reviews for any of the flavors, didn't really care for the few flavors I tried. Even the last time they came out with a round of cores, I thought "Really? Still going with this?" Nice to see some new less gimmicky varieties in these truffle flavors. Additional reviewers seems like a good idea. More content bring more views. And it would be a good way to cover regional ice cream. I like to read about flavors and brands I can’t access. Tried the cherry Garcia and tonight dough pint slices. Really, really liked Cherry Garcia. Tonight dough was not my fav - but I’m not really a peanut butter person. I also found the new Hagaan Dazs ice cream cookie bars (whatever they are called). I surprisingly liked the vanilla version better than the caramel version. All are worth a try. The only cores I still see on the shelf in my local grocery stores is "Boom Chocolatta". I don't think that one is going anywhere which makes me glad because it's my favorite flavor. Well, my favorite flavor aside from the Speculoos one, but I was able to kill a pint of those in one 15p minute sitting and was buying 3 a week at one point, so it's probably for my own good that that one was discontinued. 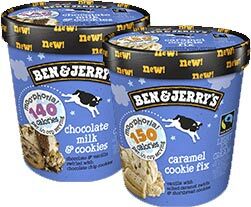 What I never understood is why Ben and Jerry's never made a COOKIE DOUGH core. Especially since they claim to have invented cookie dough ice cream as we know it. I bet that would've been a hit. Holy Toledo! I just read the description of "Chocolate Shake It" and I'm so excited for that. I love malt flavor in ice cream AND B & B's marshmallow swirls. I'm just confused about the "cookie covered truffles" description. So are they panache truffles rolled in crushed cookies?